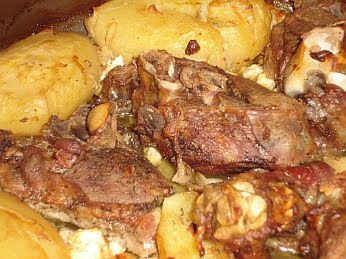 Roast lamb with potatoes is rather a common dish, but this is a way that it is prepared often in the villages here. The difference being the inclusion of feta cheese and also the fact that the whole potatoes are crushed (but not split) before they are put in the oven. Try it! On a hard surface place a cloth over the potatoes and beat them with a flat stone or similar implement to crush them, but not completely. 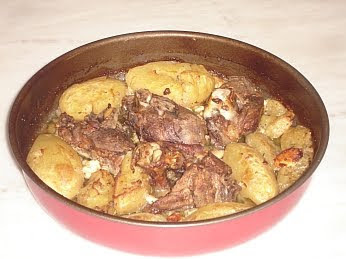 Place the lamb in the centre of an oven dish with the potatoes around it. Spread the crushed garlic, oregano, salt and pepper evenly over them. Add the 500ml water and stir slightly. Cover just the lamb loosely with aluminium foil. Place in a pre heated oven at 200 degrees Celsius for 1 hour. Remove from the oven, turn the lamb and potatoes over and remove the foil. Crumble the feta cheese and spread evenly over the potatoes. Put back in the oven for another 30 minutes until it colours nicely. I love this dish. It looks so yummy and tasty. I consider it a gourmet food since lambs are rare in my country. How I wish I can go to your country and savor the delicious dishes you are featuring in this blog. For now, I have to content myself in just fantasizing the food, hehehe, lol. Thanks for the yummy post. God bless. I tried lamb one time and thought it was gross but my husband says it probably wasnt cooked right. Your pic above looks pretty good though. Did ths last night. Was absolutely delicious and very easy, even though I forgot the foil! Just did this last night for a Greek dinner, it was delicious! But a note for first timers on this recipe- remember to check you have the correct heat and the oven is on. ( We made the mistake of having it at 200 F instead of 200 C, and the oven was turned off.) But overall, it would of been quite easy, but it was very very yummy!